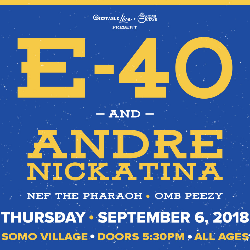 Ineffable Live and Second Octave Present E-40, Andre Nickatina, Nef the Pharoah, and OMB Peezy live at SOMO Village Event Center on Thursday, September 6, 2018! 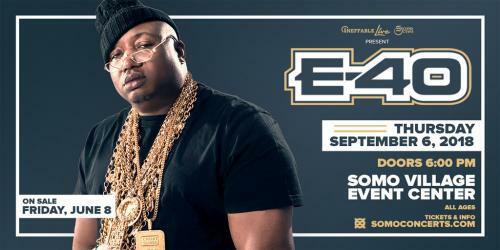 With millions of records sold, nationwide sold out shows, loved by both the streets and respected amongst his peers, without question E-40 continues to reign supreme. Empowering a familiar cliché that states, “If it’s not broke, don’t fix it” the Revenue Retrievin’ series continues and the most underrated rapper returns with two brand new albums entitled “Revenue Retrievin’ Graveyard Shift” and “Revenue Retrievin” Overtime Shift.” March 29, 2011, will mark the release of the 15th and 16th albums from one of the biggest rap artist to come from the west coast. Artists T-Pain, Tech N9ne in addition to E-40’s bay area conglomerate Guce, Black C of RBL Posse, Laroo, Turf Talk, Cousin Fik, J. Stalin and The Click all grace the forthcoming albums. E-40 and his son Droop-E who also raps and produces will once again share Executive Producer credits on both albums. 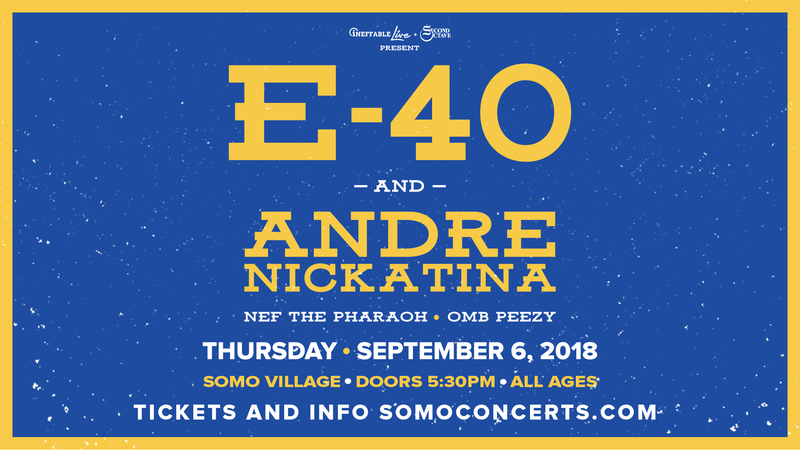 Born and raised in the Fillmore District of San Francisco, Andre Nickatina has been a hip-hop luminary since the release of his critically acclaimed debut The New Jim Jones (1993). Without saying so, for over two decades Nickatina has had his finger on the pulse of what is raw, uncut, and capable of capturing the mind and ears of listeners. Never one to follow or ride trends, Nickatina is a rare breed of artist… one of the last original trendsetters. His reputation in the hip-hop community is legendary, as an artist who was not only present during the golden era of hip-hop, but is also one of the few musicians who has helped the music grow and who has remained ultimately relevant with each successive album he has released. Rapper OMB Peezy was born in Mobile, Alabama in 1997. Part of a musical family, Peezy started rapping at age 12, soaking up Southern rap influences like Kevin Gates, Soulja Slim, and Masta P while developing his own style. Peezy was still in his teens when he started to make serious waves with his music, dropping the blistering single "Lay Down" in 2016. The track caught the attention of many, including rapper Nef the Pharaoh, who played the track for Bay Area legend E-40. E-40 signed Peezy to his 300 Entertainment/Sick Wid It label. By now relocated to Sacramento, Peezy released the singles "When I Was Down" and "Porch" in 2017 before releasing his debut mixtape, Loyalty Over Love, later that year.